LG Signature—a flagship refrigerator from Samsung comes with stylish stainless-steel body with a scratch-resistant textured finish giving it an utmost premium look. This exquisite yet impeccable exterior design personifies minimalism. Interiors of the refrigerator are built of stainless steel with the platinum wall. Stainless steel imparts good insulation, helping to smoothly maintain cold temperature, while the platinum wall provides an upscale look and keeps the stored food fresh for longer. Taking cues from its rival, new series of the double door refrigerator from LG comes with Dual Fridge—technology which lets the user convert the freezer into the normal refrigerator. LG’s converter technology is arguably the fastest with conversion time being less than 70 minutes. With just a press of a button, it lets the user increase refrigeration capacity by 1.4 times (if they don’t need a freezer). High-end premium side-by-side refrigerators from LG comes with InstaView Door-in-Door technology. When the user gives a simple two quick knocks on the sleek mirrored glass panel, the refrigerator illuminates (for around 10 seconds), allowing the user to see what’s inside the easy access compartment. It’s a handy feature if one simply need to know, for instance, whether to buy particular food item or the milk. 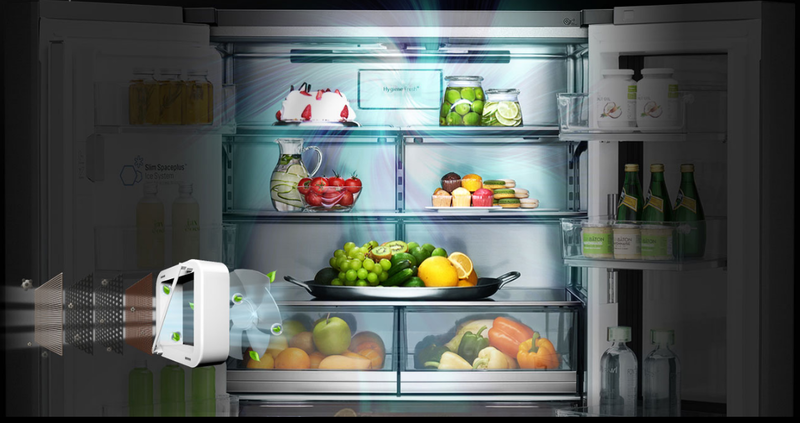 There is another quirky feature called Auto Open Door, which when enabled, gently opens the door of the refrigerator automatically when the user steps into the zone of the door opening light sensor located at the bottom of the refrigerator. This feature would be especially useful for old-age/ailing elders who find it slightly difficult to handle bulky refrigerators. Latest double door refrigerators from LG comes with Ice Beam Door Cooling technology that maintains the even temperature throughout the refrigerator. It circulates air uniformly in multiple directions from its multi air flow vents along with the back so that every corner of the refrigerator is evenly cooled. This decreases the temperature gap between the inner part and the door side of the compartment. Thus, the stored food item remains fresh for longer. Also, they do this uniform cooling 35% faster than the conventional cooling system. 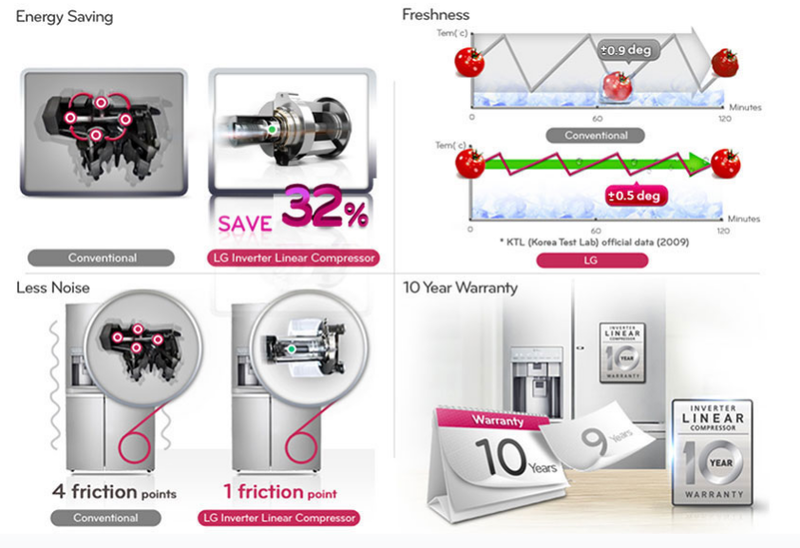 LG’s new line of refrigerators (including single doors), comes with advanced and energy efficient Inverter Linear Compressor. They save up to 32% energy by adjusting cooling power depending on the amount of food loaded in the refrigerator. Because they use piston drive in place of the reciprocal one, refrigeration performs with optimal efficiency leading to big energy savings. This compressor operates within a temperature range of ±0.5°C—almost half the temperature variation as compared to the ordinary compressor. Compressor comes with fewer friction points that greatly reduces noise (up to 25%). New series of direct cool single door refrigerators from LG now comes with Solar Smart feature. These refrigerators come with a solar panel that generates DC voltage when the direct sunlight is incident on the panel. This DC voltage is generally intermittent due to varying intensity of the sunlight. Solar charge controller converts this intermittent DC voltage to fixed voltage. But then refrigerators work on AC instead of DC. So, external inverter like UPS or PCU is generally required alongside the battery. Now, if the user can make provision of these devices based on the power rating of the refrigerator, LG refrigerator can use sunlight as the source of energy (if available in ample quantity) thus saving power and money. Another good thing about these modern LG refrigerators is that they can work without stabilizer. This means refrigerator can work steadily and reliably without getting damaged due to excessive flow of electricity in case of voltage fluctuations. Also, if voltage fluctuation exceeds the preset permissible limits (130V-290V), the power supply is automatically switched off, so it does not cause any harm to the refrigerator. Hygiene Fresh+ also comes with a carefully designed fan that amplifies air purifying process ensuring food products stays fresh for much longer. Also, gasket coming in the modern refrigerators is made up of anti-bacterial material. This airtight gasket seals in the freshness by prohibiting the entrance and accumulation of bacteria-laden spores and dust particles, that generally blights the stored food. Thus, this formidable combination of Hygiene+ filter and anti-bacterial gasket decimates harmful bacteria up to 99.99%. Crisper is the bottom-most compartment of the refrigerator used for storing vegetables and fruits. Latest series of LG refrigerators come with special latticed-type crisper to regulate moisture so that stored food item remains fresh. It maintains the optimum amount of moisture conductive for the preservation of fruits and vegetables. To maintain the freshness of food for longer, this grid patterned crisper cover condenses extra humidity and evaporates moisture from the grid pattern. Crisper and other shelves of the modern LG refrigerators is made up of toughened glass capable of handling heavy food load. 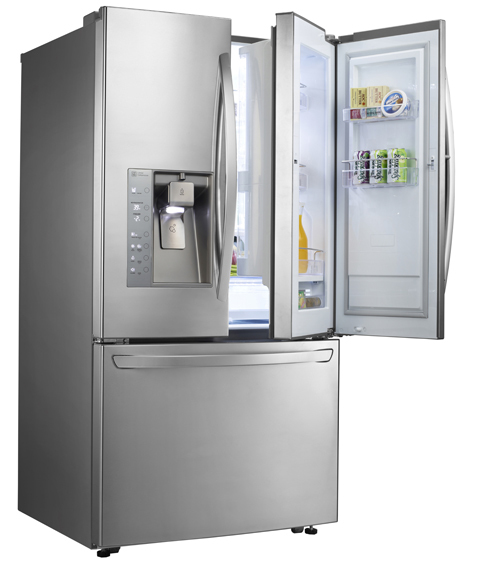 With the load bearing capacity of 175 Kg, LG refrigerators are the best in the business. So, the users can freely store even the denser food items stored in the heavy utensils inside the refrigerator without worrying about the possibility of the damage due to excessive load. Modern LG refrigerators come with bright yet efficient LED lighting inside the refrigerator. This new LED lighting which is not only slimmer but also softer and much more energy efficient. As they occupy lesser space, they help in increasing the usable fridge space for storing the perishables. This LED lighting system emits much lesser heat than the ordinary bulbs. So, the food would inside the refrigerator remains much more immune to temperature swings owing to the lighting arrangement. LG’s flagship refrigerator LG Signature comes with premium Lumishelf LED lighting under each shelf to give brighter and clearer view of refrigerator’s interior even if it is fully stuffed. The LED bulbs used helps in reducing the energy consumption by up to 77%. The best part is that they are around 26 times more durable than the conventional lamps found in older refrigerators. Consumers can save a good sum of money as they consume much less amount of energy while having a good longevity, meaning lesser repairs and replacements. Flagship models from LG come with Smart ThinQ, a smart refrigeration control technology. The refrigerator comes with eclipse display with Wi-Fi connectivity which lets the user to conveniently control and monitor their refrigerator simply using their smartphone. It comes with the option of enabling or disabling the auto opening of refrigerator alongside the child lock feature. There is another very useful feature called Express Freeze, which when turned on, will make the compressor and fan run at the maximum speed/capacity to quickly lower down the temperature inside the freezer. Although this functionality would turn off automatically when the requisite cold temperature is reached, users also have the flexibility of manually turning this off. LG without an iota of doubt is a reliable brand to choose a right refrigerator. But there are few areas where LG can improve a bit. One of them is inconsistent cooling. Users have reported this usually in the side-by-side models where one side was observed to be slightly cooler than the other. This may be because of the door-in-door design, in which users are more likely to open right side given it easier access, which in turn meant that warm air would often surge into the right side (where this door-in-door is located) of the unit while the left door remains much more immune to warm air (due to less frequent door opening). A lot of new refrigerators from LG comes with a big egg tray holder. Though it is removable, it does not lead to any additional freeing up of usable space. So, if you are strictly vegetarian then make sure to filter out such refrigerator models from your selection. These were a few not-so-good things about LG. But barring them, LG is a formidable brand offering all types and class of refrigerators for a wide spectrum of customers. Starting with the basic single door direct cool refrigerator for bachelors and couples to the large volume side-by-side refrigerator for big affluent families demanding the latest and the smartest of refrigerators. LG alongside Samsung is presently the only brand providing digital inverter even in the single door refrigerator. Most of the new refrigerator from LG comes with a cooling gel which would keep the food fresh and cool even in case of power cuts for up to 10 hours. LG refrigerators have been awarded at CES (Innovation award) and International Forum (Gold award) and acclaimed by reputed organizations like TechRadar and Reviewed. Backed by accolades from industry experts and the overwhelming statistics of owning around 30% of the market share, LG is surely the most trusted brand to go to buy your next/new refrigerator.